Ominifix® Dressing and Retention Tape is latex-free, flexible and easy to apply. Comes in 3 sizes - 2" wide by 10 yards, 4" wide by 10 yards, or 6" wide by 10 yards. The soft non-woven flexible fabric is ideal for use in securing wound dressings, catheters, and drainage lines. The fabric Omnifix® is made of is coated with a non-sensitizing latex-free synthetic adhesive making it ideal for patients with hypersensitive skin and a tendency toward skin allergies. It is soft and supple and easy to apply, even in the most-difficult-to-tape areas. Omnifix® conforms well to body contours and will not restrict movement. Its release paper backing is wave slit to improve speed and ease of application. 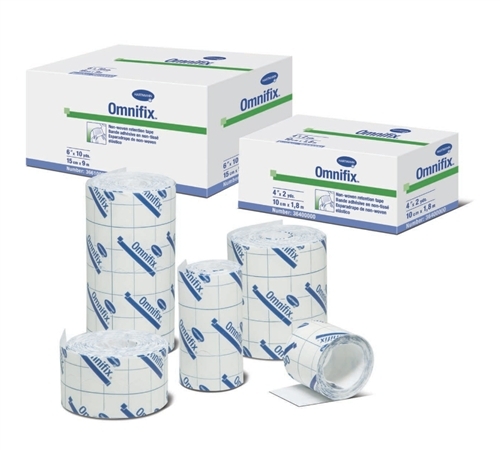 Omnifix® is latex-free and individually boxed. It is air and water vapor permeable, It does not absorb X-rays.